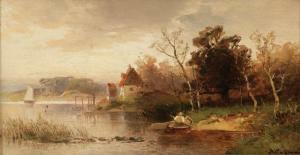 Find artworks, auction results, sale prices and pictures of Nicolai Von Astudin at auctions worldwide. 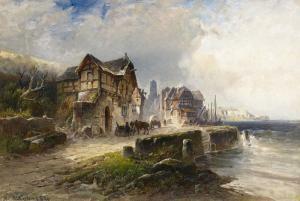 Fischerdorf in der Bretagne. Signiert und datiert unten links: N. Astudin 1890. Öl auf Leinwand. 40,5 x 60cm. Rahmen. Auf dem Keilrahmen altes Klebeetikett mit Titelangabe. Fishing Village in Brittany. 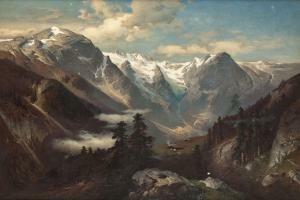 Signed and dated lower left: N. Astudin 1890. Oil on canvas. 40,5 x 60cm. Framed. On the stretcher is a former adhesive label with details of title. 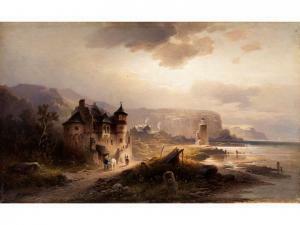 Nicolai Von Astudin - Rocky Cost With Ruined Tower. 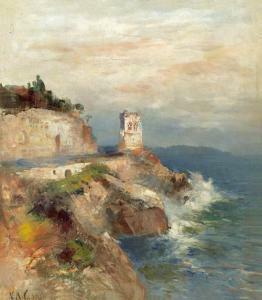 Rocky cost with ruined tower. Oil on canvas laid on board. Signed lower left: N Astudin. Öl auf Leinwand auf Karton aufgezogen. Unten links signiert: N Astudin.